There are 12 Assisted Living Facilities in the Manitowoc area, with 9 in Manitowoc and 3 nearby. The average cost of assisted living in Manitowoc is $3,824 per month. This is higher than the national median of $3,346. Cheaper nearby regions include Two Rivers with an average starting cost of $3,283. To help you with your search, browse the 25 reviews below for assisted living facilities in Manitowoc. On average, consumers rate assisted living in Manitowoc 4.6 out of 5 stars. Better rated regions include Howards Grove with an average rating of 5.0 out of 5 stars. Caring.com has helped thousands of families find high-quality senior care. To speak with one of our Family Advisors about assisted living options and costs in Manitowoc, call (855) 863-8283. Manitowoc, Wisconsin, is called the state's maritime capital due to its beautiful harbor on the shore of Lake Michigan. Seniors in the area can take advantage of the beautiful Manitowoc Marina and the historic Mariners Trail which are just perfect for walking and riding bikes. In this community of 33,000 people, 7.7 percent are aged 65 and over. There are nine assisted living facilities in Manitowoc and three in the neighboring community of Two Rivers, Wisconsin. In Manitowoc and the rest of Wisconsin, assisted living facilities are designed for those who require some level of care, but opt to live without 24-hour nursing support. 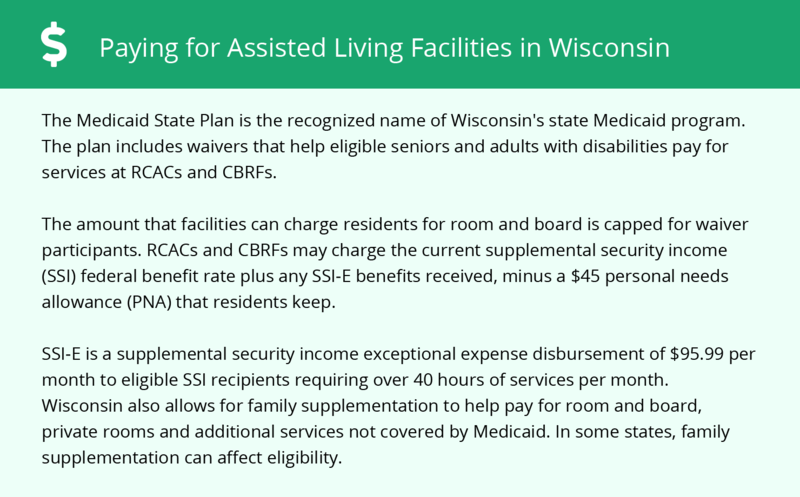 Assisted living facilities are monitored and controlled by the Wisconsin Department of Health Services. Manitowoc experiences a significant amount of lake effect snow each year due to its proximity to Lake Michigan. Average snowfall each year is 42 inches, and temperatures dip to an average of 13 degrees Fahrenheit. Summers can be very warm with average highs of 78 degrees. The winter snowfalls and high heat and humidity can create respiratory and mobility complications for some seniors. The cost of living in Manitowoc is 15.1 percent lower than the national average. Items with lower than average prices in the Manitowoc area are groceries, housing and utilities. The sales tax rate in Manitowoc is favorable for seniors at 5.0 percent compared to the U.S. average of 6.0 percent. Those seniors who choose to remain employed in Manitowoc will experience a higher than normal income tax rate of 6.3 percent compared to the U.S. average of 4.6 percent. Seniors may access public transportation in Manitowoc via the Maritime Metro Transit (MMT). Reduced fares are offered to individuals aged 65 and over, as well as those with disabilities. Applications for the Reduced Fare Card are available at the Maritime Metro Transit office. The Senior Center in Manitowoc is a great place to socialize, learn and have fun. Activities are open to individuals aged 55 and over. Typical activities include bingo, bus tours, day trips, monthly movies, weekly card and board games and craft classes. Manitowoc is home to world-class medical facilities, including Holy Family Memorial and Aurora Medical Center in the event of medical emergencies or illness. Assisted Living costs in Manitowoc start around $3,824 per month on average, while the nationwide average cost of assisted living is $4,000 per month, according to the latest figures from Genworth’s Cost of Care Survey. It’s important to note that assisted living rates in Manitowoc and the surrounding suburbs can vary widely based on factors such as location, the level of care needed, apartment size and the types of amenities offered at each community. 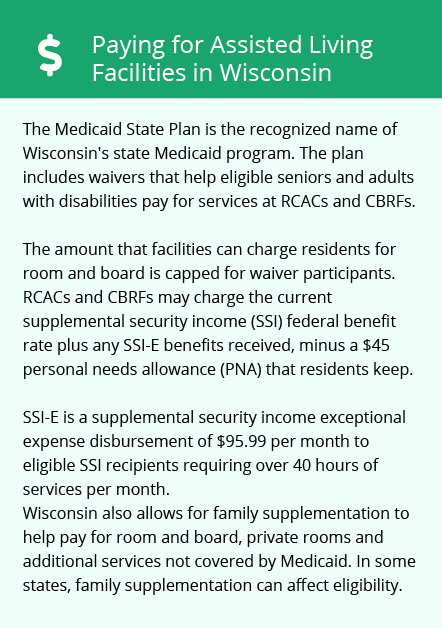 Wisconsin residents may seek financial assistance with their assisted living choices through Medicaid, PACE, and SSI-E.
Manitowoc and the surrounding area are home to numerous government agencies and non-profit organizations offering help for seniors searching for or currently residing in an assisted living community. These organizations can also provide assistance in a number of other eldercare services such as geriatric care management, elder law advice, estate planning, finding home care and health and wellness programs. To see a list of free assisted living resources in Manitowoc, please visit our Assisted Living in Wisconsin page. Manitowoc-area assisted living communities must adhere to the comprehensive set of state laws and regulations that all assisted living communities in Wisconsin are required to follow. Visit our Assisted Living in Wisconsin page for more information about these laws.